The carefully brokered deal that respects the rights to all parties of the North and the Republic holds the best chance for a peaceful solution to the 'troubles'. Although the Irish constitution was amended to relinquish territorial claims to the 6 counties of Ulster under British rule, the agreement gives the Republic cross border rights for the first time. 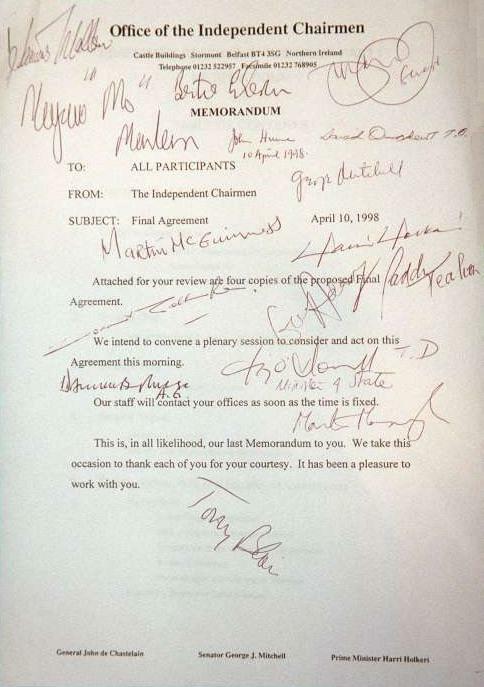 The document offers a democratic framework for parties who heretofore refused to be in the same room let alone talk to each other. Most importantly the people of the North are given the right to work together to choose their own ultimate destiny. This in itself offers the best chance of hope and peace for a united Ireland. There are extremists who feel the way to derail this process is to exercise political intransigence. The people North and South have spoken in unprecedented democratic numbers. We pray that their aspirations will be peacefully realized. The resignation of NI Secretary Peter Mandelson has been widely received as a favorable move. The fragile accord continues to be bogged down by discord over the Patten Report policing recommendations, decommissioning, and demilitarization. David Trimble and former SDLP leader John Hume awarded the 1998 Nobel Peace Prize. Hume in accepting the prize remarked that "the real issue about arms and guns is that they have been totally silent. It is up to political leaders on all sides to deliver agreed structures for peace that will forever remove the underlying causes of violence and division on our island." 6/25/98 Election in Northern Ireland for the 108 member legislative assembly. The pro-agreement Ulster Unionists led the polling with 28 seats. The moderate republican SDLP gained 24 seats while Sinn Fein tallied 18 seats. 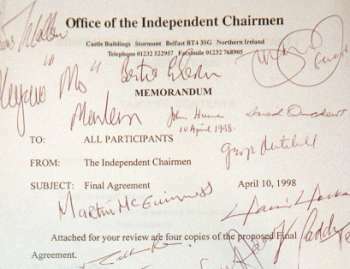 Anti-agreement unionist parties garnered a total of 28 seats The Assembly met 7/1/98 to elect First Minister David Trimble, and Deputy Minister Seamus Mallon of the SDLP. The Assembly will gradually take over power from Britain's Northern Ireland Ministry. North - South Ministerial Council including First and Deputy Minister from Northern Ireland, and the Irish Prime Minister, are to begin meeting as soon as possible after the Assembly election. The council will meet at least twice a year on the highest level. An Irish - British council including government representatives from both Dublin and London is also to begin meetings. June 1998 Dublin and London has enacted legislation to allow early release for prisoners. There has been calls to halt prisoner releases due to the deadlock over the decommissioning issue. Summer 1999 Deadline for an independent commission to report policing arrangements for Northern Ireland. Former Conservative Northern Ireland Minister, and Governor of Hong Kong Chris Patten is Chairing the Commission. The Commision is currentky investigating alleged Royal Ulster Constabulary (RUC) involvement in sectarian murders, and alleged 'shoot to kill' orders. Autumn 1999 Deadline for review of Ulster criminal justice system to be carried out by the British government in consultation with the political parties to the accord, as well as non-governmental organizations. May 2000 Deadline for disarmament of all paramilitary groups.